Time to sell your Capri condo? Read about today's resort-market buyer. 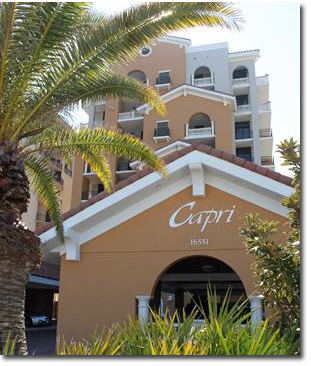 Capri condominium is a low-density complex in the central Perdido Key, Florida area and near the Alabama state line and Orange Beach. The condos in Capri are close to a wide range of local attractions in both Alabama and Florida and situated on the pristine white-sand beaches that Perdido Key is famous for. Capri was built in 2006 and all condos directly face the Gulf of Mexico. Amenities for Capri feature an indoor heated pool, Gulf-front pool, steam room/sauna, spa/hot tub, and an exercise room. The Capri condominium floor plans are four-bedroom condos at approximately 3,100 square feet. Capri is a great condo for a second home on the emerald-green waters and white-sandy beaches of the beautiful Gulf of Mexico. Capri is also a short drive to the Pensacola area and all of the amenities afforded by a larger metropolitan area, such as the regional airport, making air travel an easy option for guests and owners at Capri condominium in Perdido Key, Florida. Please let us know if you would like further info for Capri or any other condos, homes, or real estate along the Florida Gulf Coast or would like to schedule a private viewing by emailing info@condoinvestment.comor by calling (251) Area-Pro (251-273-2776) for immediate assistance.